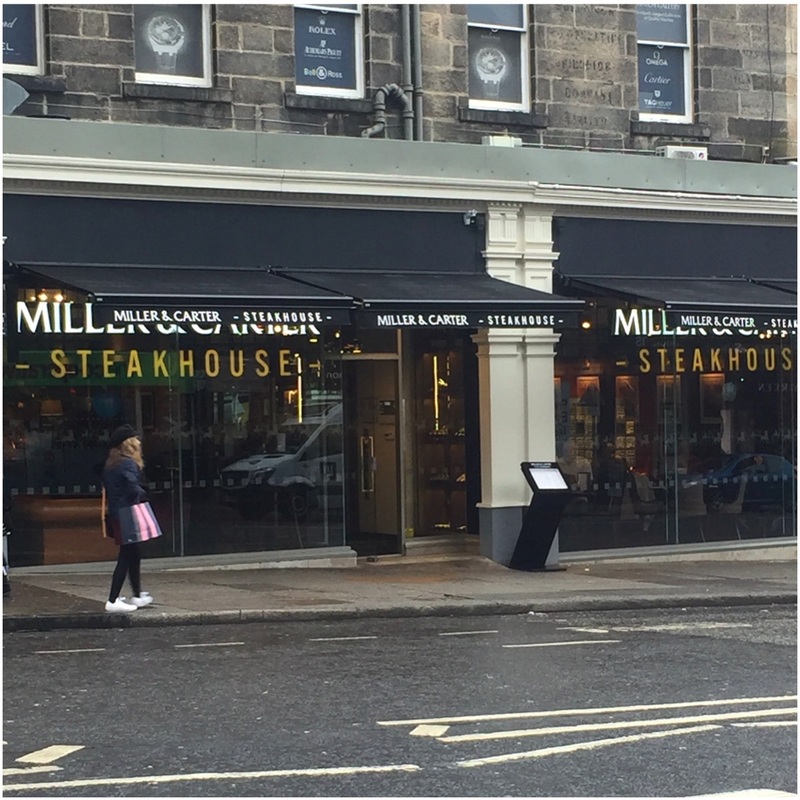 At the start of the month when we were in Edinburgh we went to Miller and Carter on Fredrick Street and had the best meal of our trip. Since coming back we've been recommending it to everyone so I thought I'd share my experience here too. Miller and Carter is a steakhouse restaurant and it's dotted across the UK, from Glasgow and Edinburgh down to Bournemouth and Bath. There's over 80 restaurants in the UK and you can use their website to find your nearest. This was my first visit to Miller and Carter as unfortunately they have no restaurants further North but it'll definitely not be my last. We booked a table through the website and because we were dining on a Thursday night near the beginning of January, just for 2 people, I thought there would be quite a few times to choose from but unfortunately the website only had 5pm and 9pm available. It was easy to use though and got a text confirmation and reminder on the day of our booking. When we got to the restaurant I was expecting it to be packed but there was quite a lot of free tables. It seems like you might be able to phone to have more choice of reservation times. We were hungry and more than ready to dine at 5pm none-the-less. When we arrived we were taken straight to our table and given plenty of time to check out the drinks menu, main menu and the January Set Menu. We were so impressed by the set menu deal that we both ordered from it. Two courses for £15.95 is the perfect way to banish the January blues and it's an amazing price. The January set menu is running from Sunday to Thursday all day and from 12pm to 5pm on a Friday and Saturday for the whole of January. What a treat! The drinks menu had a good selection and as I was on holiday I was attracted to the cocktail menu the most. 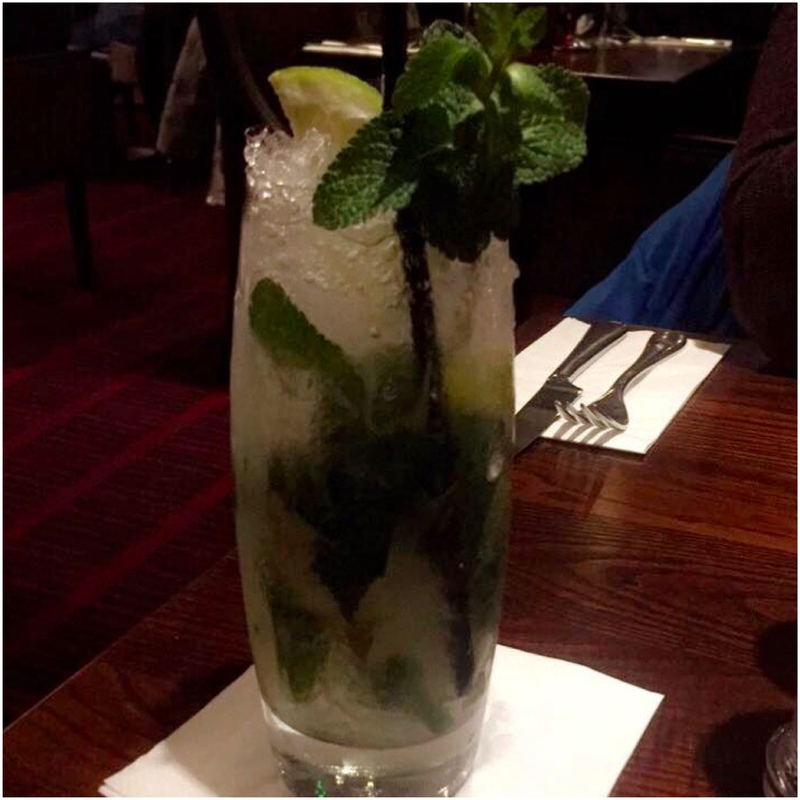 I was tempted to have a glass of wine to compliment my steak but ended up with a classic mojito instead. It was made fresh and tasted delish! Knowing that I wouldn't be able to eat a 3 course meal (and shouldn't after the amount I ate over Christmas time) I ordered a starter and main course whilst Mark ordered his main course and dessert - that way we could share the starter, share the pudding and enjoy the lot! There was 3 choices on the starter menu which isn't loads but because it is 3 completely different dishes it had something to suit most people. 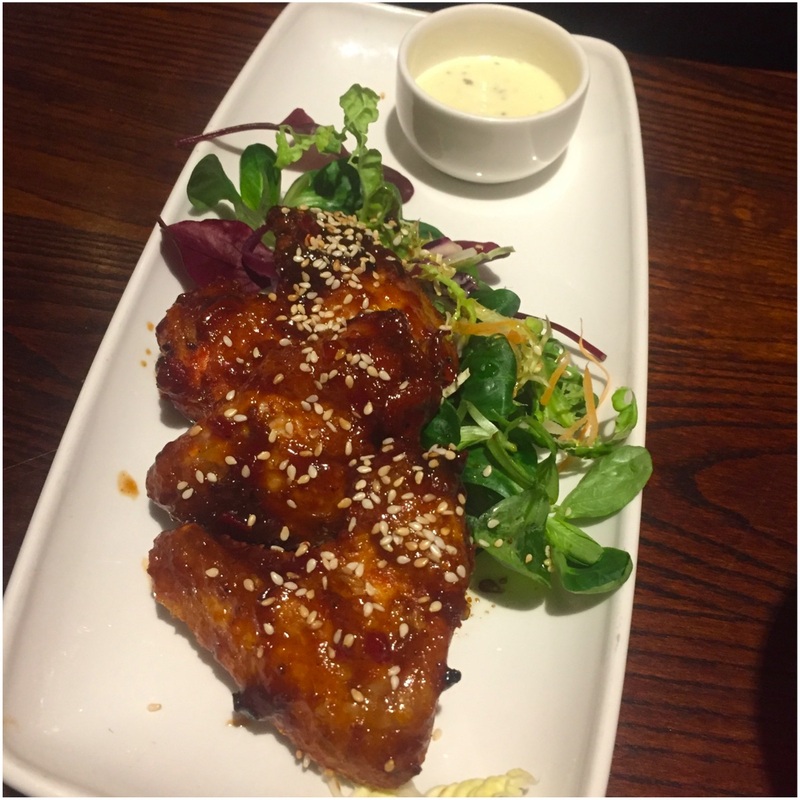 We had the Sticky Chilli-Hoisin Chicken Wings with Buttermilk Dressing. The dessert menu was the same but again a good variety. The main course section had 5 dishes then 3 options for steak. 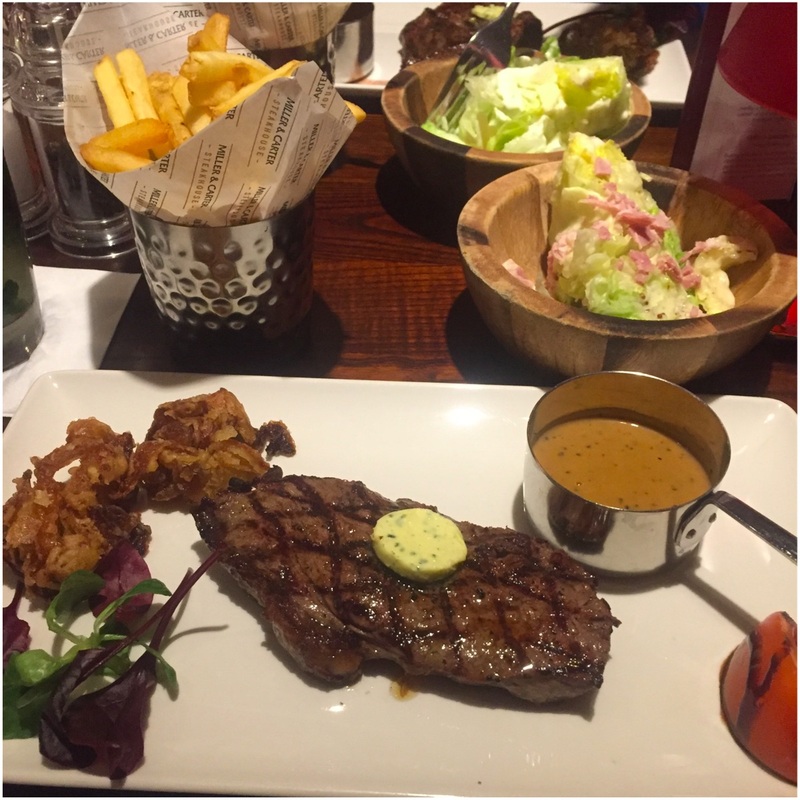 There was no way I was going to visit Miller and Carter without having the steak experience. The 8oz Rump Steak was included in the Set Menu price but for £5 more you could upgrade to a 8oz sirloin or 8oz ribeye for £7. The steak is served with parsley butter, chips, onion loaf and tomato. Then as a side you get lettuce wedge with a choice of 4 dressings and a choice of 5 steak sauces. It was so nice to be able pick out exactly what you wanted. I had bacon and honey mustard salad dressing and cracked peppercorn steak sauce - both were beautiful. I've never tasted fried onions as good as their onion loaf and my medium steak was really well cooked. The pot of chips felt a bit like the magic porridge pot, they just felt never ending - no complaints from me! For dessert we picked the Rich Chocolate Brownie but I would have been happy with the cheesecake or cookie too! We actually chose the brownie by checking out the table next to us who had ordered one of each dessert. 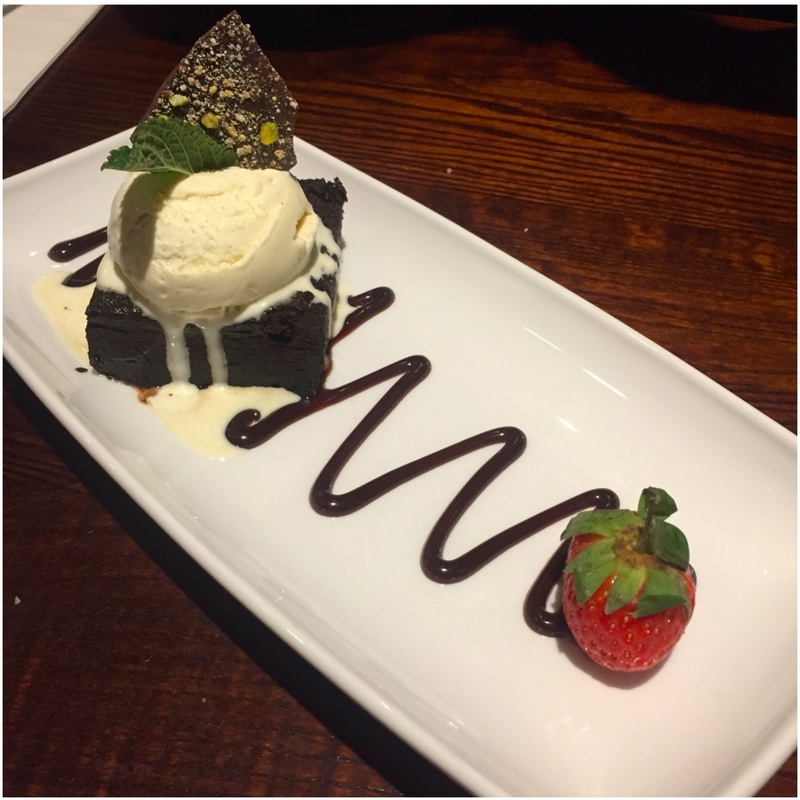 The brownie was a generous size and the vanilla bean ice cream complimented it perfectly. All of the food was absolutely perfect, we didn't leave a single crumb behind. Quite often set menus have smaller portions but it seemed that all three courses were full sized. We left the restaurant with full tummies and smiles on our faces. The waiter was brilliant from start to finish and nothing was too much to ask. If you've got a Miller and Carter near you then I highly recommend the January Set Menu. It was a really affordable treat and made for a lovely date night. If you can't get to a restaurant before the end of January, or maybe if you're struggling through a Dry January or have no cash to splash then maybe you'll be tempted by their Valentine's Set Menu from the 12th to 15th of February or their Sunday Set Menu offering 3 course for less than £25.